MANILA, Philippines – The October 2017 Psychologist board exam results including the full list of passers, top 10 examinees, top performing and overall performance summary of schools, among other related announcements are available at this website as PRC releases the results online on November 7, 2017 or four (4) working days after the last day of board examination. As announced, 96 out of 148 examinees passed the exams. The October 2017 Psychologist licensure exams are administered by PRC Board of Psychology headed by its Chairman, Ms. Miriam P. Cue and its members, Ms. Alexa P. Abrenica and Ms. Imelda Virginia G. Villar on October 29-30, 2017 at PRC testing center in Manila. According to the Commission’s Resolution No. 2016-1019 series of 2016 entitled “Schedule of Licensure Examination for Year 2017”, the target release date of October 2017 Psychologist board exam result will be in four (4) working days after the last day of board examinations or by November 7, 2017 (Tuesday). However, results may also be released earlier or later without prior notice. On the same exam conducted by PRC on August 2016, results were released after three (3) working days while on July 2015, results were out after five (5) working days. The schedule of online appointment for issuance of Professional ID and Certificate of Registration will be on November 22-28, 2017. 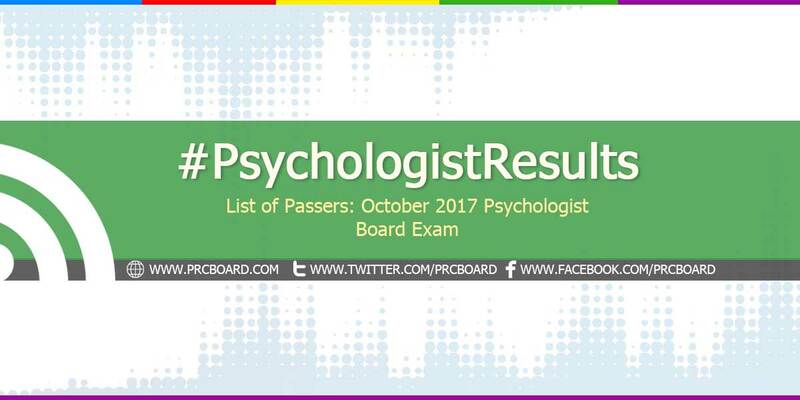 The October 2017 Psychologist board exams covered topics from Advanced Theories of Personality (20%), Psychological Counseling and Psychotherapy (25%), Advanced Psychological Assessment (30%) and Advanced Abnormal Psychology (25%). Psychology is one of the programs with less number of examinees being administered by the Professional Regulation Commission. On the same exams conducted by the board on August 2016, 63 out of 120 examinees passed. Cherie Ann Tam Lo and Sabrina Chua Caedo Tan, both from Ateneo de Manila University - Q.C., clinched the first two (2) spots. Ateneo de Manila University - Q.C., was the only school in the top performing schools list having 21 out of its 24 examinees passed. During July 2015 Psychologist board exam, 36 out of 76 examinees passed. Due to less number of examinees, there were only three (3) top spots declared. Sampaguita Adapon from Ateneo de Manila University - Quezon City topped the board exam having 82.30% rating. She was followed by Marie Rose Morales from De La Salle University Manila garnering 81.70% and Anne Marie Topacia having 80.80%. To receive up-to-date news on full results of October 2017 Psychologist board exams, we advise our visitors to bookmark this page, visit PRC official website or follow us at our social media pages via Facebook and Twitter. Go mommy k go go! In Jesus name go ivana! Go ivana in Jesus name Sana makapasa ka go Ivana!